Kriegsdienst in der österreichischen Armee. Ankunft mit dem Schiff "Rotterdam". 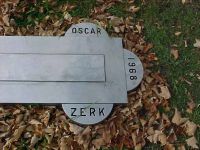 Biography Oscar Zerkowitz was born on may 16 1878 in Vienna. When he emigrated to the United States he changed his name to "Oscar Ulysses Zerk" and became a world-famous inventor. One of his most prominent creations was a grease fitting known as "the zerk", a lubrication system which became the basis for those used on nearly every car, truck, plane, and other mechanized vehicle. At the time of his death in 1968, it was estimated that 20 billion of these fittings had been manufactured. During Oscar's long life, he patented 300 other inventions including leg-slimming hosiery, a weaving-machine, a braking system for street-cars, the first six-cylinder internal combustion engine, quick-freezing ice cube trays, spatterproof nail brushes, vibration-free camera tripods, oil well recovery systems, and refrigerators for cars. He is also credited with designing and patenting stamped metal wheels and wheel covers for automobiles (which, in the 1920s, replaced wire wheels). Additionally, he devised a type of non-skid brakes for cars. appealed directly to the Austrian emperor, Franz Josef. Surprisingly, he was granted a private audience where the emperor was so impressed with Oscar's grasp of technology, he immediately decreed that the youth be admitted to the college. After graduating, Oscar went abroad in 1901. He spent four years in Bradford, England, a British textile center, where he developed and improved his weaving machine. He then returned to Austria for several years, where he turned his attention to the automobile. He designed the first six-cylinder motor car and later, a forerunner of the automatic transmission. Intent on studying an American-made car, the White Steamer, he came to the United States in 1907. He arrived at Ellis Island on 9 February 1907 on the ship "America" out of Cuxhaven. Following his next arrival in the U.S.A. in 1913, Oscar formed his own company in Cleveland, Ohio, to manufacture the first Zerk grease fittings. He lost control of his company already the same year. He was visiting Austria in 1914 when World War I broke out. He was called up for military service by his native land and served four years as an army captain, winning several decorations. When the war ended, he married an Austrian woman and returned to America. She and their young daughter joined him soon after. Oscar Zerk moved to Chicago and designed an even better lubrication system. Eventually, he sold the rights to this invention to a major automative parts maker and retained a relationship as a consulting engineer. Later, when he discovered serious management irregularities in that company, he led a much-publicized stockholders' revolt against the board of directors. When he won, "Time" magazine noted -- with admiration -- "Zerk is a man to be watched." In 1938, tired of working in downtown Chicago, Oscar sought a more rural setting, a place where he could live comfortably, indulging in his longtime passion for flowers and gardening. Also, during his years of traveling, he had collected artworks in Europe, mineral and natural science specimens thorughout America, and curios from around the world. He wanted a suitable home to house those treasures. Eventually, in 1939, Oscar chose a three-story mansion in Kenosha, Wisconsin -- "Dunmovin" -- which had been built years earlier by Kenosha industrialist, Henry Cooper. There, at his Cooper Road estate, Oscar would live for the rest of his life. Oscar virtually gutted the house and then remodeled it to his exacting specifications. Special care was given to exquisite decorating touches, such as quilted-satin wall coverings. World War II, he hosted formal garden parties, not only for a fascinated Kenosha society, but also for military personnel stationed at nearby bases. He also went to Washington during the war years in response to a request by the United States government to redesign his earlier gyroscopic movie tripod for use in aerial combat motion picture photography. "Inventors have a high responsibility to serve mankind by using their gifts." He kept right on inventing until shortly before his death at the age of 90. Oscar's four marriages were all to women much younger than himself. He married his first wife in 1919, when he was 41 and she only 18. That marriage ended in divorce in 1934. He married his second wife about 1944, when he was 65 and she only 23. After her death in childbirth in 1945, he married a third time. His new wife was 19 while he was close to 70. That marriage was annulled in a "messy case" that went all the way to the state Supreme Court. Finally, he was married -- this time happily -- to his fourth wife, Dorothy, 33 years his junior. He died on December 8, 1968, in Kenosha.